To honor the 40th anniversary celebration, in June 2009, of the Stonewall Riots, OutHistory.org for the first time published nine pages of New York City Police Department records created early on the morning of the rebellion’s start, June 28, 1969. 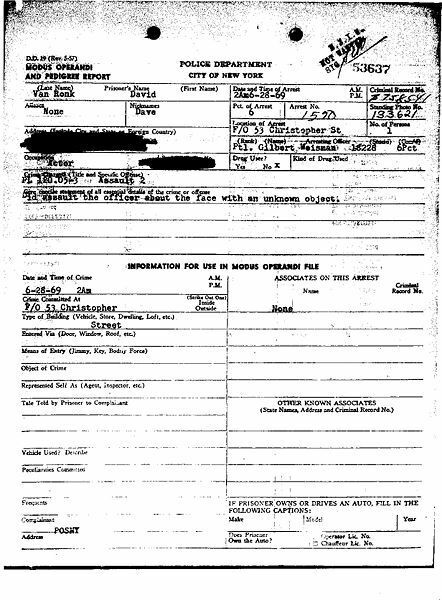 Officer Gilbert Weisman of the 6th Precinct charged that David Van Ronk, “Actor” (he was actually a well-known folksinger) “Did assault the officer about the face with an unknown object.” The heterosexual, resistant Van Ronk was arrested, handcuffed, taken into the Stonewall, and later taken away in a patrol wagon. He eventually pleaded guilty to “harassment,” a violation, and was later sued by Weisman for assault, and paid the officer a fine. Van Ronk's arrest was reported at the time of the rebellion, and is discussed in David Carter's history. Did assault the officer about the face with an unknown object.